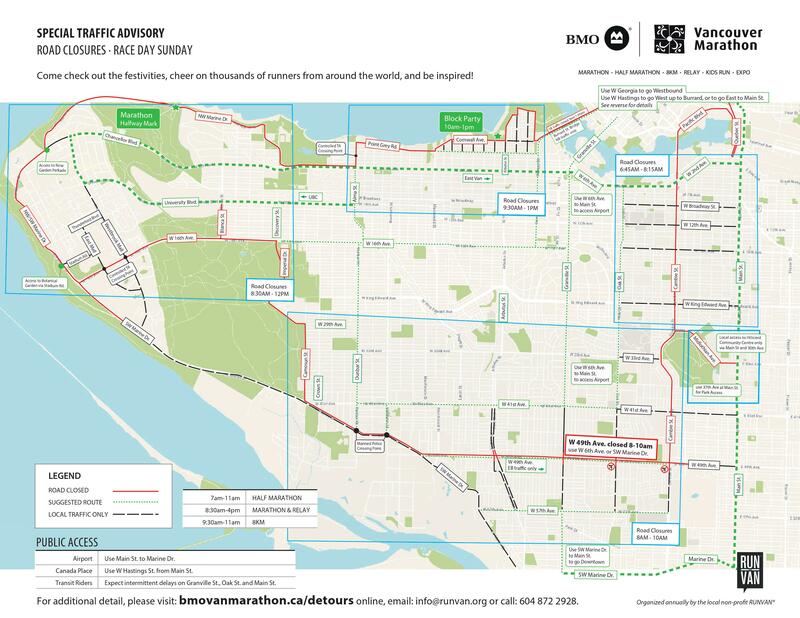 The Vancouver International Marathon Society would like to advise residents and business owners of temporary road closures and traffic control measures to accommodate this annual event on the first weekend of May. Thanks for your patience and cooperation in helping Vancouver deliver a world-class marathon. Your safety is taken seriously and we respect the neighbourhoods through which BMO Marathon Vancouver courses run. Please travel safely. Adhering to strict bylaws, cost of the closures will be paid for by the non-profit Vancouver International Marathon Society RUNVAN®. RUNVAN® works closely alongside the City of Vancouver, Vancouver Police Department, Vancouver Park Board, and Translink to ensure Vancouver’s only Marathon event goes off safely and smoothly. Safety is everyone’s top priority and this plan allows us to adhere to international marathon race standards. Support from the community and all stakeholders involved in delivering this longstanding Vancouver tradition is truly appreciated. Traffic control personnel will be stationed at major intersections and access points along the race route to safely manage and redirect traffic. Motorists are asked to avoid travel during the impacted hours and consider alternative times for local trips. Motorist who do travel during these times are advised to please plan ahead for potential delays and stoppages on affected routes. TravelSmart. The event follows a rolling road closure/opening protocol. This means that roads will close and later re-open as runners pass through the course; NO roads are closed for the entire duration of the race. See above for detailed Road Closure & Detour Maps. The BMO Vancouver Marathon also has an event time requirement of 7 hours. Participants must maintain an approximate 8-minute per kilometre pace until Burrard Bridge – reaching Burrard Bridge or the 30KM mark by at least 1pm – and a 14-minute per kilometre pace from Burrard Bridge to the Finish Line. 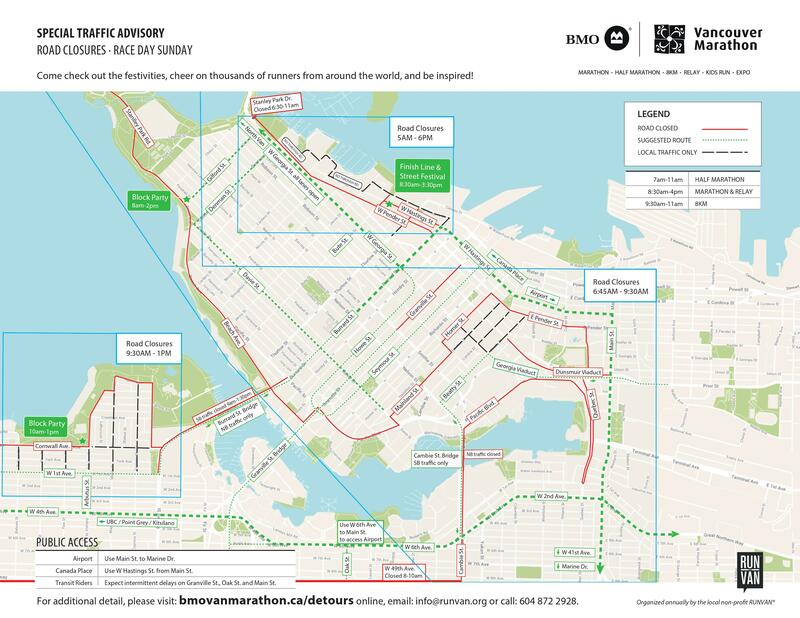 If you or someone you know lives along the BMO Vancouver Marathon course, or if you are traveling to and from Vancouver for the event, please be aware that extensive street closures will take place on Race Day. ‘No Parking’ zones along the course will also be enforced in the early morning hours on Race Day. Join us at the BMO Vancouver Marathon annually on the first weekend of May! Run, cheer or volunteer with runners from nearly 65+ countries. The Marathon, Half Marathon, 8KM and Relay courses showcase the City of Vancouver and all share an energized downtown Finish Line. 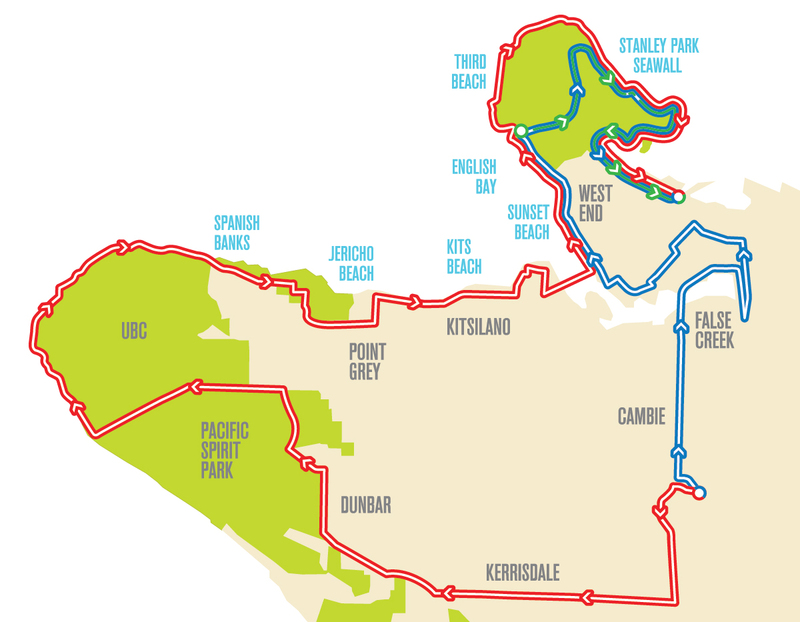 Race routes will impact traffic in Vancouver’s Riley Park, Coal Harbour and Downtown on Saturday, and Riley Park, Cambie, Oakridge, Fairveiw, Kerrisdale, Dunbar, UBC, Point Grey, Kitsilano, False Creek, Chinatown, Yaletown, West End, Coal Harbour and Downtown neighbourhouds on race day.